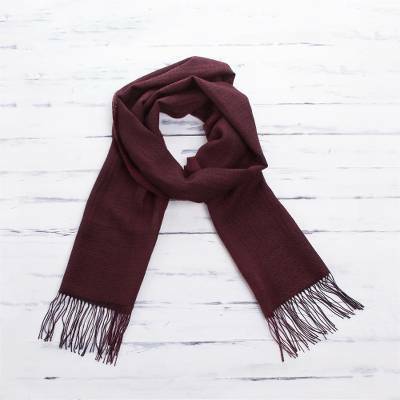 Maroon 100% Alpaca Woven Textured Unisex Scarf from Peru, "Cabernet"
Raquel and Gregor of Peru design this lightweight, soft and warm 100% alpaca fringed scarf. A rich wine color is achieved by weaving together dark brown and maroon yarns. The scarf has a subtle tone-on-tone texture created by a weave pattern that alternates rows of waves and crosses.